Last weekend, University Theater presented Seeing the Beast, an experimental play that was part TEDtalk, part fairytale, and part nature documentary. The play focused largely on the issue of overpopulation of deer in Hamilton and offered possible solutions — which tiptoed between farce and fact. In the opening scenes, an actor playing a TEDtalk-style speaker advocated for the “rewilding” of Hamilton in order to increase biodiversity in the area. He took questions from the audience about proposed initiatives to manage the deer population by introducing predators like wolves or inviting hunters into the area. After the speech, another actor underwent a fairy tale transformation from a human to a deer. Soon, several performers dressed as deer came on stage. 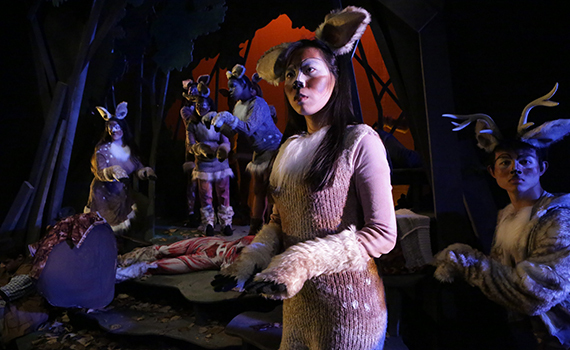 The audience was then encouraged to follow the herd of “deer” into a hallway behind Brehmer Theater that led to “the woods” — a backstage performance space that was transformed by trees and fall leaves. The seating restrictions in this new area meant that, this time, the humans were overpopulated. In this idyllic scene, as a nature documentary narrator described the deer in their natural habitat, the frequent presence of a hunter and his gun on stage hinted at the inevitable. Seeing the Beast made the audience confront conflicting attitudes toward deer: How can people appreciate the animals one minute and see them as nuisances in need of extermination the next? The show was formed over two months by students who pieced together personal observations and improvisations. For example, the actors studied deer in the wild in order to capture their subtle movements on stage. “A lot of rehearsals involved improvising certain scenes and parts of those ended up in the production,” said Alec Hufford ’18, who played the character of the Rational Man. As playwrights, creative directors, scene designers, and more, the students had a hand in every aspect of the play. “To have a really big part in creating it, including the phrasing and lines, was amazing to see,” Hufford said. The students also considered information and findings from research about deer overpopulation that was conducted by Professor Catherine Cardelus’s biology class last year. “It’s a play about Hamilton, it’s a play about this community,” said the show’s director, visiting artist Scott Sheppard.